Customer loyalty’s an ever-expanding topic. It can be tough to see the wood for the trees. 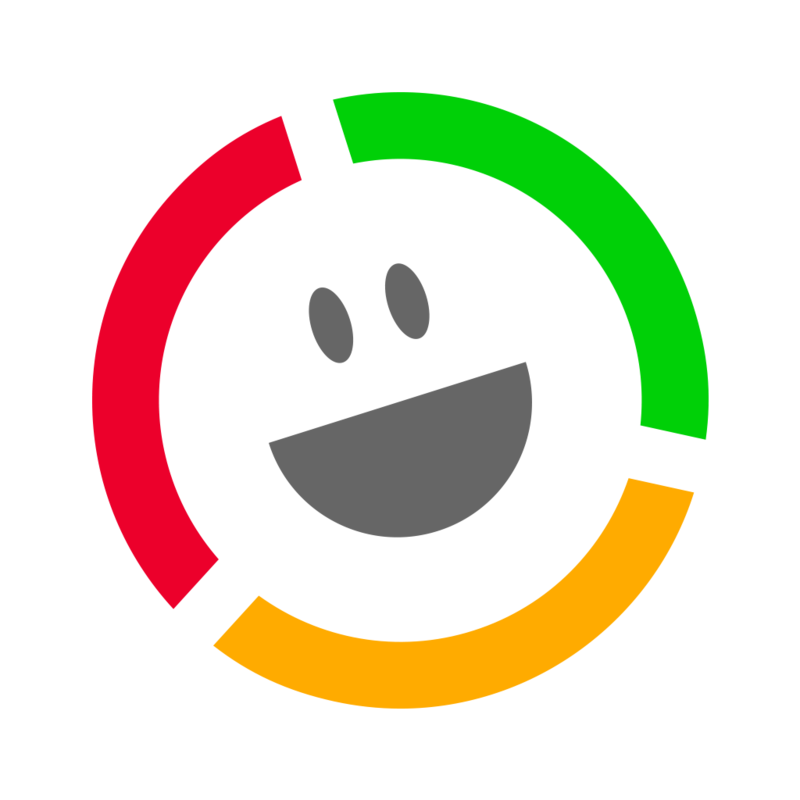 How do customer loyalty and customer retention overlap? What’s the latest thinking? How can staff retention affect customer loyalty? What should I read or watch this year to stay up with the current trends? So we’ve dug into our resources, our books, the events we go to and the people we follow to curate our top 50 resources for customer loyalty. If you’re putting together a presentation, brushing up on your knowledge, or looking to go deeper into the topic, this post’s for you! Companies who excel at customer loyalty also excel at staff retention. 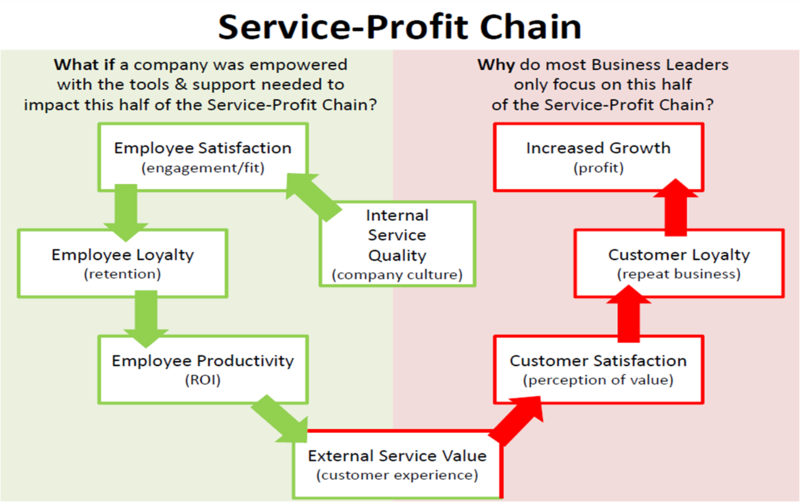 This Profit-Service link was originally uncovered by Harvard Business School and great companies ensure they keep their staff for the long haul. 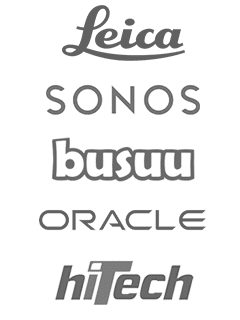 Peruse the Fortune Best Companies list for ideas you can use. You don’t get onto the Superbrands list without a dedicated and passionate customer following. 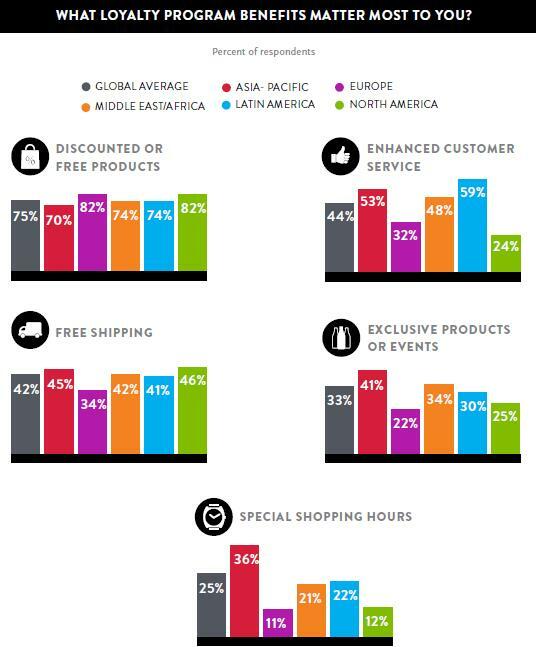 Take inspiration from how the world’s Superbrands retain their customers from this global listing. The list highlights Customer Service leaders, and notes how an unswerving focus on the customer can result in innovation at every level in the company. Forbes claims all the small companies on its listing chose to be the Best, not the Biggest. Look here for inspiration from companies you’ve never heard of, but who knock it out of the park for customers every day. This set of lists splits companies up into dozens of sub-categories including “Best for Women”, “Best for new grads” and “Best for Camaraderie”. If you’ve got a specific issue you need to solve in your employee retention, start here. An interesting take on creating a customer-centric business, and the importance of reorganizing your operations to cope with the (very different) modern customer. A small business play here, but an interesting one. Some points that should be obvious for small businesses (but often aren’t) such as, have you set a budget for customer retention? And looking for tiny and unique enhancements within what you already do. Lots of great stats and metrics in here to satisfy your inner nerd. Jerry Jao focuses on the science behind customer retention in 20 minutes’ worth of great content, including thoughts about how you need to acquire the right customers to start with; the ones that are easier to retain. Describes how we’ve all been focused on customer acquisition, and we’ve hired a lot of data people are a result. He highlights the danger of relying solely on data people when relationship skills and retention is all-important. A fascinating read. This book investigates “wow” style customer service, and finds out that it’s actually “effortless” experiences customers are looking for. If you’re looking to retain more customers through your service, this is a must-read. Hands on, practical guidance and techniques and ideas you can use immediately are at the heart of Watkinson’s Ten Principles. The emphasis here is on psychology and how to use it to change experiences for your customers in order to retain them. This book works at the intersection of customer success and customer retention. The author focuses on how you can orient your organization around a “farming” mentality, where customers are cared for, retained and grown, rather than a pure-play new business focus. This book argues that many organizations are failing to harness the power of technology to provide a seamless customer experience. It explains how there are many disjointed channels being employed by businesses, and offers up a technological framework for customer retention. Featuring powerful case studies on Fidelity and Office Depot, this book highlights the financial gains that come with good customer retention. It shows how even in a flat stock market, customer experience leaders can outperform and describes how your business can achieve it too. Large 3 day event focused on customer retention strategies, trends, technologies, research and solutions. Senior level networking and knowledge sharing exchange event focused on customer experience and customer retention. 100o+ attendees from 70+ countries gather to discuss the latest trends in marketing and customer research. A forum for customer experience leaders who want to explore the changing relationship between brand, CX and business success. A conference focused on learning how to tap into customers’ defining moments. Whilst it may seem a bit odd to be following a retired four-star General on LinkedIn, Stan has recently left the armed forces and now brings his insight around data, organizational design, and people, to the commercial arena. People are critical to customer loyalty, so Stan’s posts are highly recommended. We have a lot of fondness for Mr Peppers here at Customer Thermometer towers. His LinkedIn is a goldmine of great customer-focused content too. ‘The key to unlocking amazing word of mouth’ and ‘5 things customers don’t want to hear’ are just two of Tara’s many LinkedIn posts. Well worth a follow. A great guide to building a company that customers love. Find out how some of the most beloved brands manage to install legendary loyalty that keeps them ahead of the pack. A breakdown of three key things that you should be thinking about to ensure that you have a successful, long-term customer retention strategy. Empower your employees to ‘delight’ customers, but rather than just giving them free rein, create a framework which will help them to succeed. Give them clear guidelines, clear measures of success, and frequent feedback. A concise article from Salesforce that focusses on four simple steps that will help you ensure that your customers stay happy…and stay with you. Customer retention should be prioritised, but it shouldn’t need to be difficult. We’re passionate about focussing on customer retention ahead of customer acquisition – find out why you should be measuring your customer churn rate and taking active steps to reduce it. Fantastic stats from across the web covering customer retention, customer service, customer feedback, customer profitability and more. “Your most unhappy customers are your greatest source of learning” – Bill Gates. Some of the most successful companies have one thing in common – they offer an amazing customer experience. We all know that keeping customers makes good business sense. But the real impact to your bottom line is so big it might surprise you! These slides provide 5 practical ways in which you can reach your retention goals. Ability to keep customers coming back is crucial for your business. Companies that measure, analyze and experiment with ways to improve retention, grow much faster. Keep more of your customers with these five retention tips. 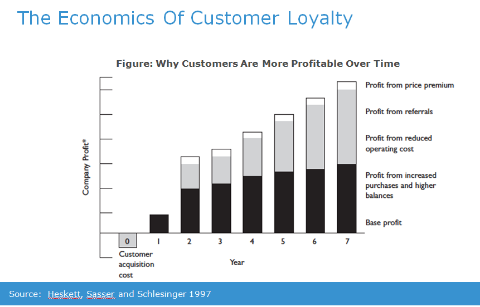 This graphic shows why customers are more profitable over time.